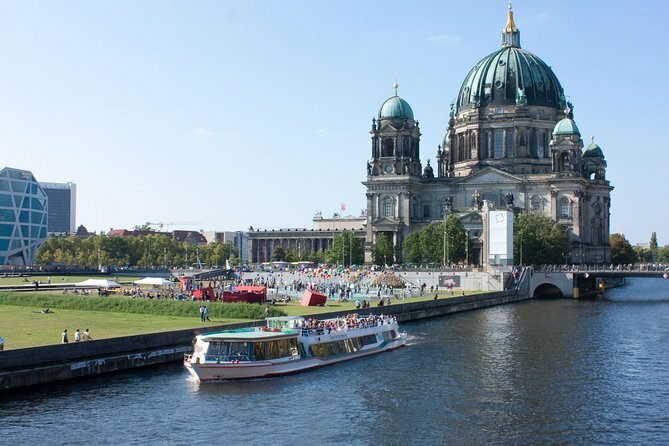 Explore Berlin with this 1-hour cruise going past all of main sights, including a pizza and a drink of your choice. With this cruise you have the unique chance to see the countless modern and historical attractions our city has to offer from a completely new perspective - and hear about their history in both English and German. Even on the hottest days of the year the light breeze acts as a natural air conditioner, providing a pleasant refreshment from the beginning till the end of your journey. Explore the beauty of Berlin with this wonderful cruise with a premium-class boat including pizza and drink. English and German commentary from the speakers on board will provided while visiting the; Museum Island, Berlin Cathedral, Berlin City Palace, TV Tower ,Red Town Hall, Nikolaiviertel, Reichstag, Government District, Main Train Station Hauptbahnhof, German Chancellery and House of the Cultures of the World.